When we last left the four extraordinary and brilliant children who make up the Mysterious Benedict Society (what now appears — hooray! — to be a series by Trenton Lee Stewart), they had just successfully completed a vital and dangerous task only they could have accomplished. At the beginning of the sequel, The Perilous Journey, all four of them — Reynie Muldoon, whose intelligence includes powers of perception; Kate Wetherall, whose intelligence is spatial and physical; George “Sticky” Washington, who can read lightning-fast and retain every word; and Constance Contraire, who, as a three-year-old, is still only beginning to develop her immense powers — are still feeling the effects of that terrible pressure. Still, they are happily looking forward to seeing each other, and especially to seeing Mr. Benedict, the reason they all know each other in the first place. Which is why the blow is all the more devastating when they arrive at Mr. Benedict’s house, only to find that Mr. Benedict himself, along with his right-hand woman Number Two, have been kidnapped by Mr. Benedict’s evil twin brother, Ledroptha Curtain. 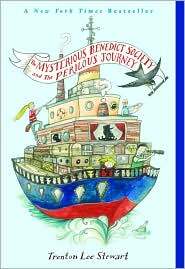 The children know that they hold the first clue that will lead to Mr. Benedict’s rescue: he himself left it for them. Can they do it without adult help, relying only on their own intuition and smarts? Their journey leads them across the ocean, to Holland and Spain and a mysterious island near Scotland, with a deadly deadline to meet. Oh, I loved this book. I absolutely ate it up. I might have even liked it better than the first one. For one thing, I adore reading about smart kids (I always thought Hermione got short shrift), and these are such enjoyable specimens that I wanted to spend even more time with them than the novel allowed. Stewart has a great handle on the way the kids interact, and how their intelligence makes some things easier for them and other things harder. He addresses the journey not just as a series of puzzles to be solved (although those are great fun), but as character development. Reynie in particular faces some tough dilemmas: he is reeling from the revelation in the first book that so many people in the world can be evil, and must learn to make his own decisions about whom to trust. I’ve talked to a couple of people about this series, and wanted to mention one thing. I think that with the combination of the cover design and the smart-orphans-battle-bad-guy plot, there is some notion that this is a knockoff of the (wonderful) Lemony Snicket series. In fact, it’s not similar at all, in tone, style, character, or narrative voice. It’s fresh and delightful, and completely its own thing. I know there’s a third novel waiting for me, and I hope there will be more. I also hope I’ve convinced you to try the first. I’ve been meaning to pick up this series for a great while. It sounds like so much fun!! It really is terrific fun. I can’t wait to read the third! I hope so! Definitely push it up your TBR list, at least. My oldest son LOVES these books. I picked the first book up on a whim a few years ago when I was in D.C. and HATING The Name of the Rose, so I decided I needed to pick something different up at the local Borders. Definitely wasn’t disappointed and had tons of fun with all the problem solving and intelligence of these kids! That said, I just didn’t feel compelled to pick up the other books in the series. I was fully satisfied with the first one. Oh, and I never thought Hermione got short shrift! I think it’s pretty clear that without her Harry & Ron would have been colossally screwed many times over! You know, the first one was really satisfying and didn’t leave a cliffhanger. But the second one is really good! Maybe even better. I agree that without Hermione, Harry and Ron would have been lost, but by short shrift I mean that especially in the early books, she’s consistently portrayed as kind of a dork. Less fun than the others, worried about rules, kind of preachy. Like that. I loved both of those books! I’m like a great big kid. Kids’ books, if written well, are definitely also for adults! Oh, shoot. Well, I’m sure he’ll be coming out with something else, though, and I’ll look forward to that!